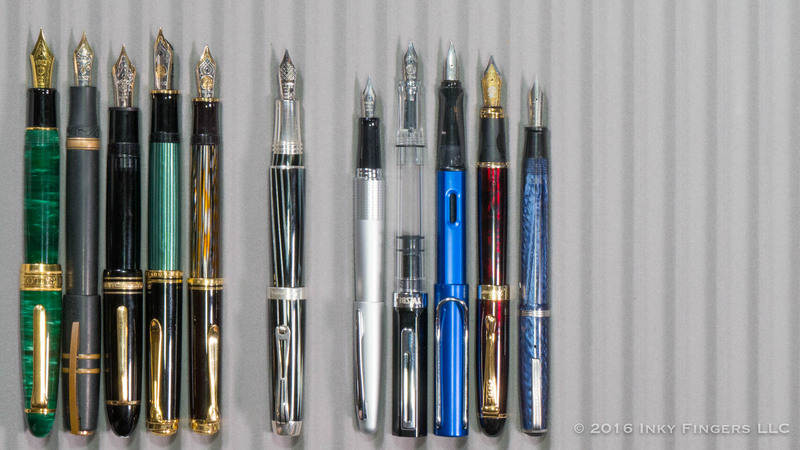 Over the last several years, I’ve had the opportunity to use several pens from the Italian pen maker, Montegrappa. 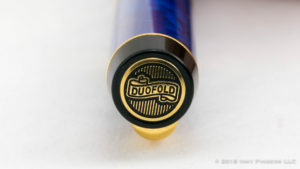 It’s a brand that is well-known in the community, but despite that, doesn’t seem to have a huge top-of-mind presence among a lot of the serious fountain pen users and collectors. 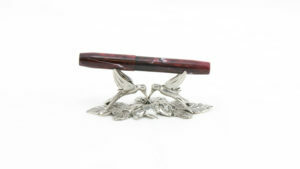 Part of that, I believe, has been due to Montegrappa’s pen designs themselves. Based on my current experience with the brand, I tend to classify their pens into one of two categories. The first category is populated with pen that feature a contemporary and relatively streamlined design: think the Fortuna white and ruthenium or the Fortuna Copper Mule. On the other end of Montegrappa’s scale are pens that go beyond flashy and straight into the realm of over-the-top gaudy: pens designed after superhero, pens covered with dollar signs, and even this monstrosity of pirate-related accoutrement. Every Montegrappa pen I’ve had the chance to review thus far has been a well-built pen, featuring good (if a bit dry) nibs. 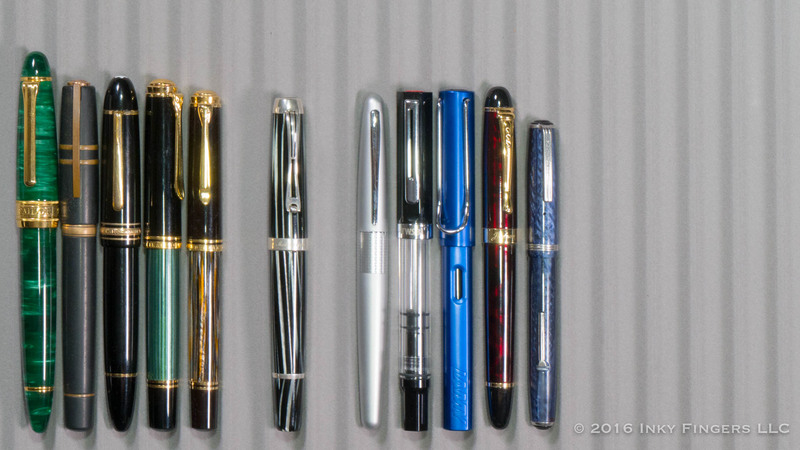 But I’m not sure I would ever describe any of the pens I have reviewed as being “refined.” Unique, clever, irreverent, flashy—just not refined. 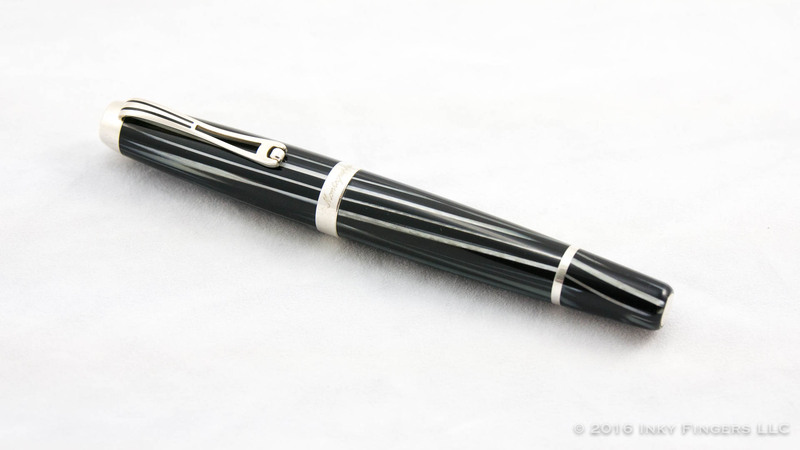 Perhaps the closest I’ve ever seen to a refined design is the Montegrappa Espressione that I reviewed several years ago, but even that overshot the mark a bit. 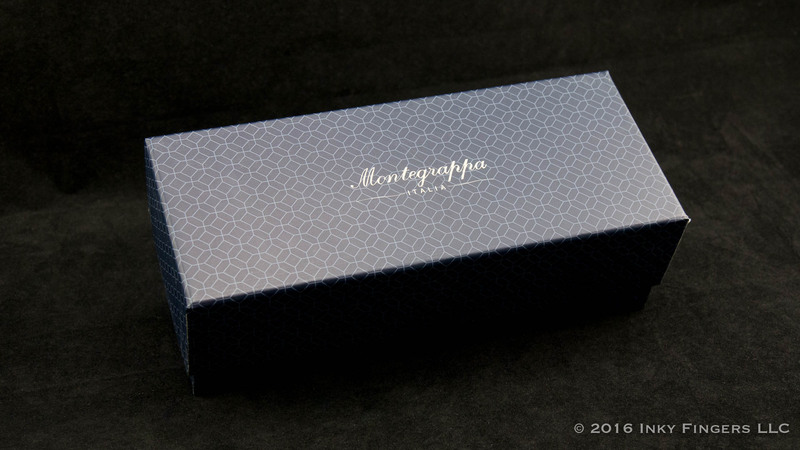 Couple that with a high-priced product line and very little in the way of entry-level offerings to introduce new fountain pen users to the brand, and it’s easy to see why Montegrappa’s doesn’t hold the same mind share as some of their other Italian competitors. 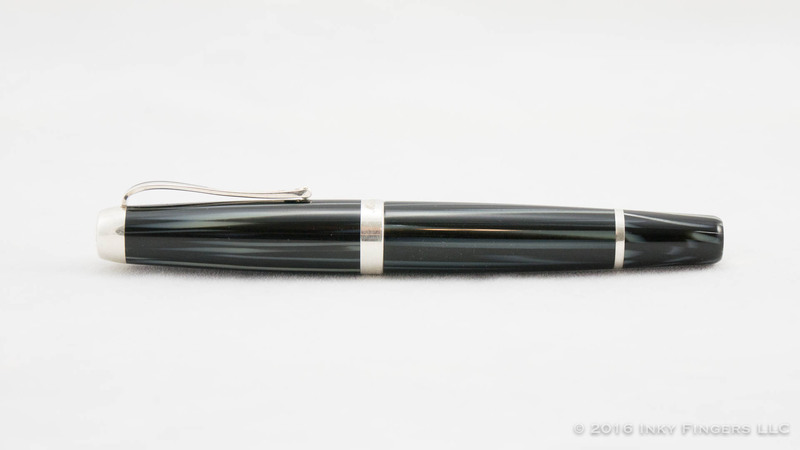 When the folks at Kenro Industries offered to loan me Montegrappa Passione for review purposes, I was interested in taking a look at the pen to see how it compared to other offerings from the brand. The Passione comes in four different colored celluloids: Mediterranean blue, Cinnamon red, orange, or the model they sent to me, the black and white-striped Zebra. 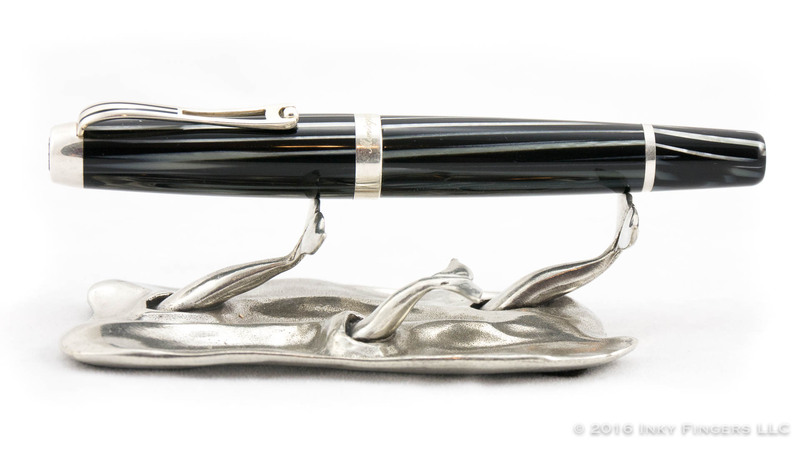 The pen is highlighted with sterling silver accents. As soon as I opened up the beautiful blue box in which the pen came, I realized that the Passione reaches a level of visual refinement that I had been missing from the brand. 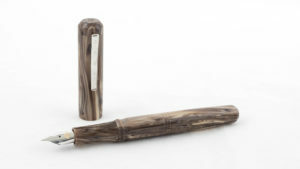 The barrel of the pen is made of the same zebra strip celluloid, and is broken only by another band of sterling silver about 4/5ths of the way down the barrel. 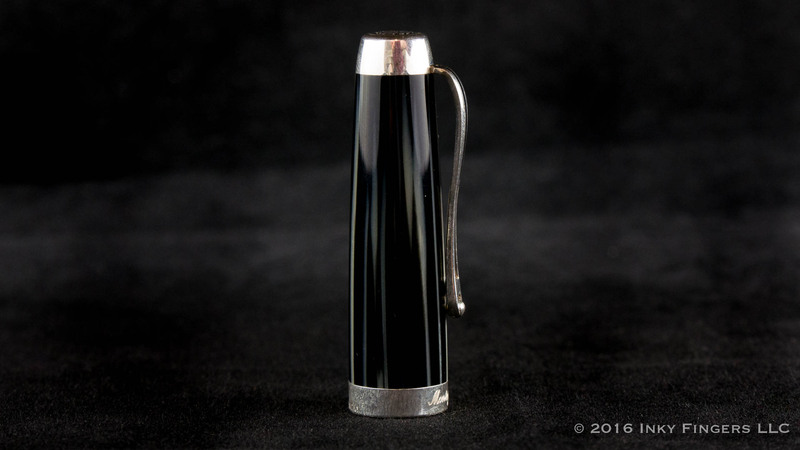 The pen then ends with a flat terminus, into which is inset a plain silver disc. The cap comes off the barrel with 1 1/2 turns. 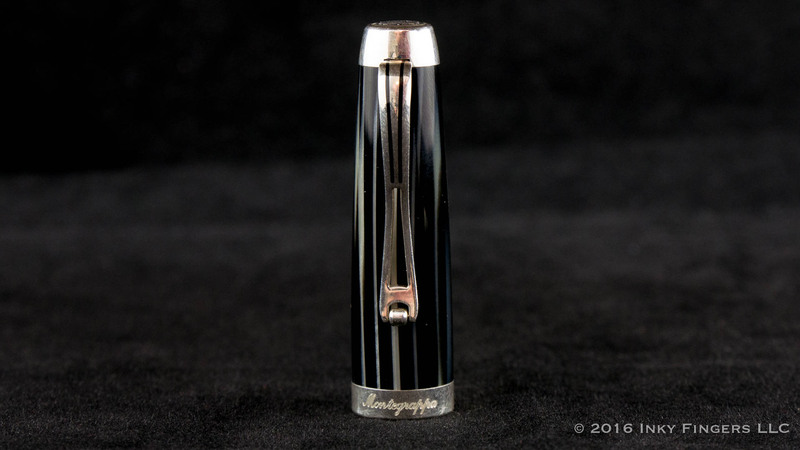 The Passione, like most of Montegrappa’s pens, uses metal block threads, but the pen’s cap is lined with a lovely plastic liner, so the threads turn very smoothly. Additionally, the block threads are cut far shallower than on other Montegrappa models, and aren’t quite so uncomfortable under the grip. 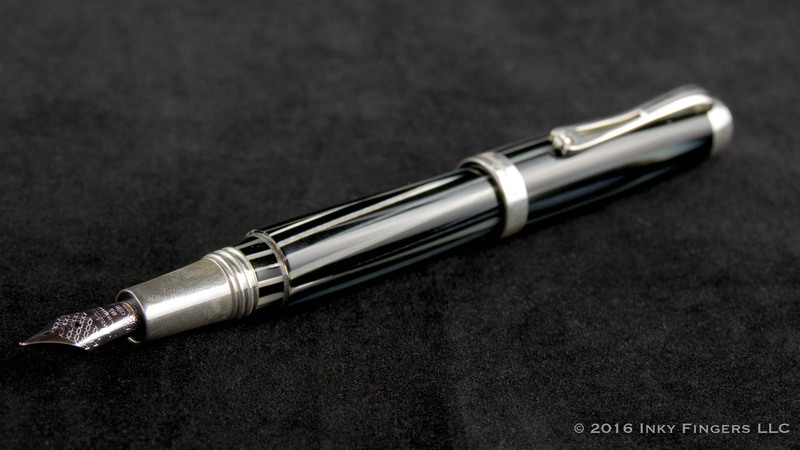 The pen uses a metal section (I’m unclear if it’s silver or steel, but there are some hallmarks on the tenon under the barrel, which lead me to believe it’s silver.) 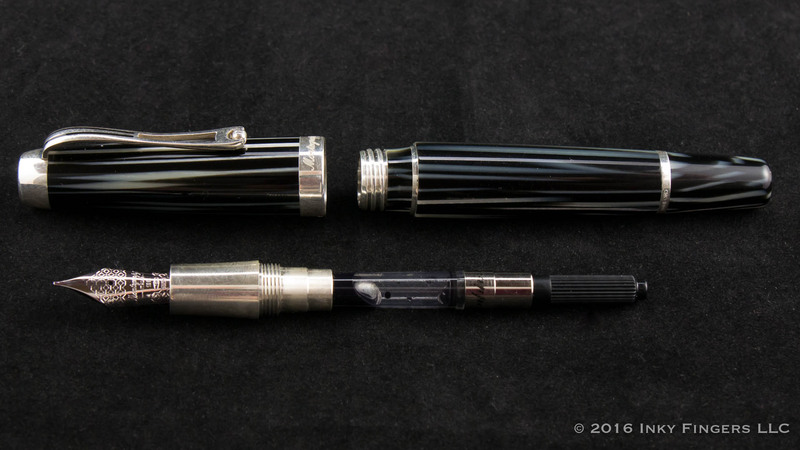 This is, in my opinion, one of the biggest and most consistent flaws in Montegrappa’s pens: their insistence on using metal sections…especially when you’ve made the pen out of such a beautiful celluloid. Celluloids feel so wonderful under the hand that putting a glossy metal section that will get slippery if you have sweaty hands and will serve as a fingerprint magnet seems like a confusing design decision. Fortunately, the grip does have a slightly concave shape which makes for a surprisingly comfortable in-the-hand experience for me. 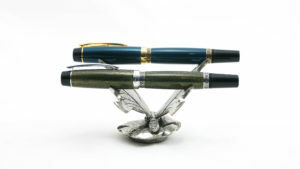 The pen is a cartridge/converter pen, and uses standard international long or short cartridges. 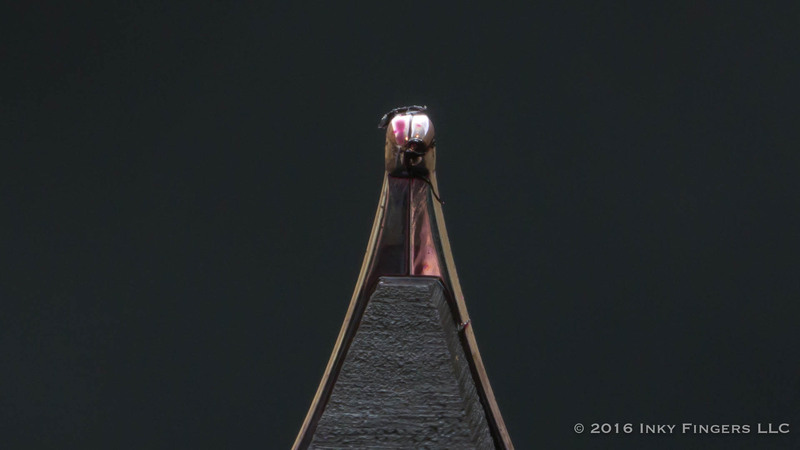 The pen comes with a high-quality, screw in-type converter. In the hand, the Passione is a lot more comfortable than I was expecting. The upside to a metal section is that the heavier metal alters the balance of the pen and pulls the weight down toward the nib, resulting in a pen that sort of nestles into the web of my hand and just sits there. Despite its weight, it’s not a pen that feels like it needs to be wrestled around the page like some heavier pens do. The pen does post, and the caps plastic liner means that you’ve got plastic on the celluloid instead of metal, but posted the pen feels a little bulbous and too long. I don’t use it posted when I write with it. Then we come to the nib. 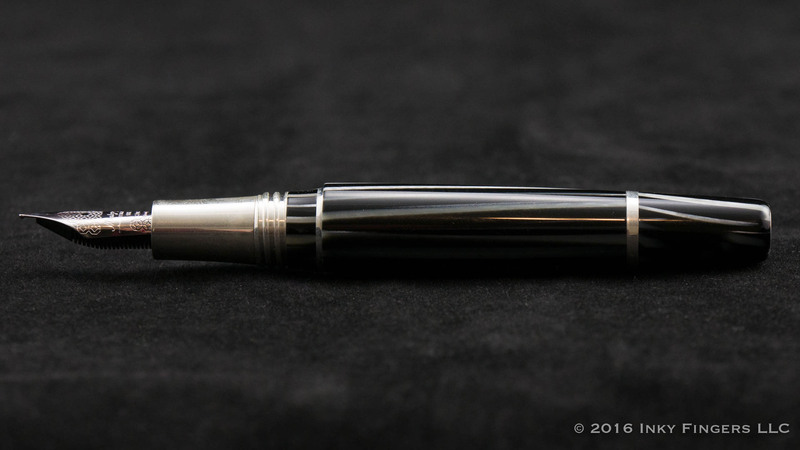 Up to this point, every Montegrappa pen I’ve reviewed has come with a steel nib. 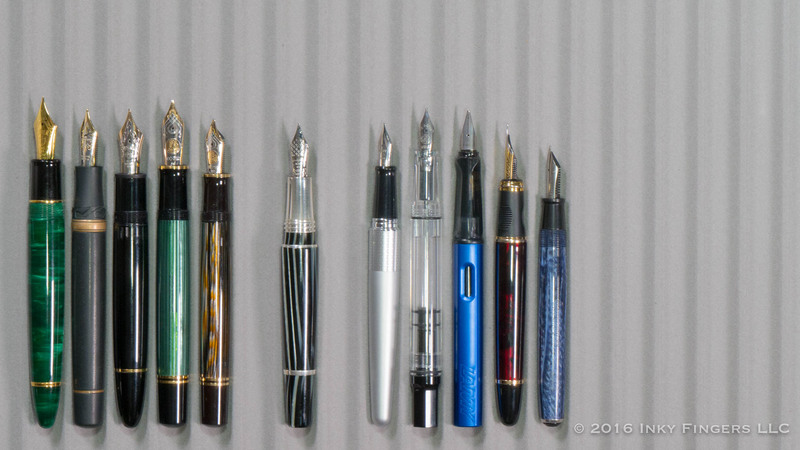 Every one has been a good nib, but none have really been the writing experience I crave. 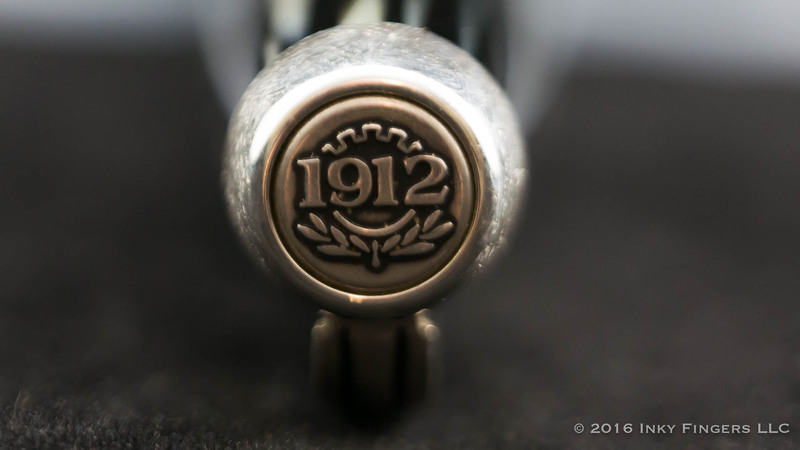 They are usually a touch dry, rather feedback heavy, and with a smaller nib gauge than you might expect from the designation. 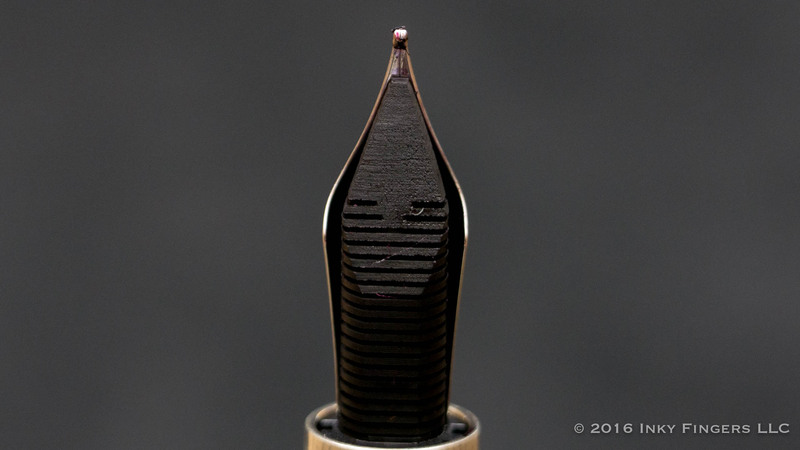 The 18k nib on the Passione is a whole different writing experience from those steel nibs. 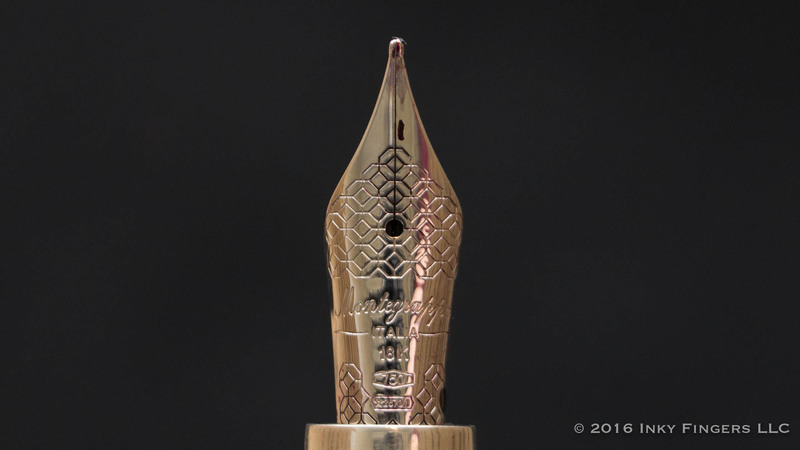 The Rhodium-plated 18k gold nib is a #6-sized nib (I’m guessing manufactured by Jowo) with a beautiful tile design stamped onto the nib’s face. 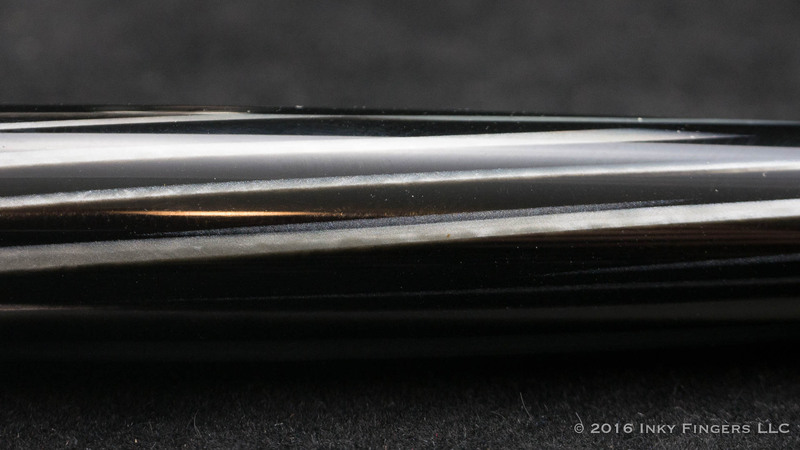 Unlike many modern nibs, this #6 nib features an ebonite feed, which I have found does a wonderful job in keep the writing experience nice and wet. The nib has a little bit of bounce to it, which provides a nice cushioned writing experience and will help show off inks that shade a lot. The nib gauge is pretty in keeping with with you’d expect for a western-style nib, and the nib tip is beatifully aligned and adjusted. It’s smooth, but with a slightly higher feedback than you might expect, but that is offset a bit by the pen’s generous ink flow. 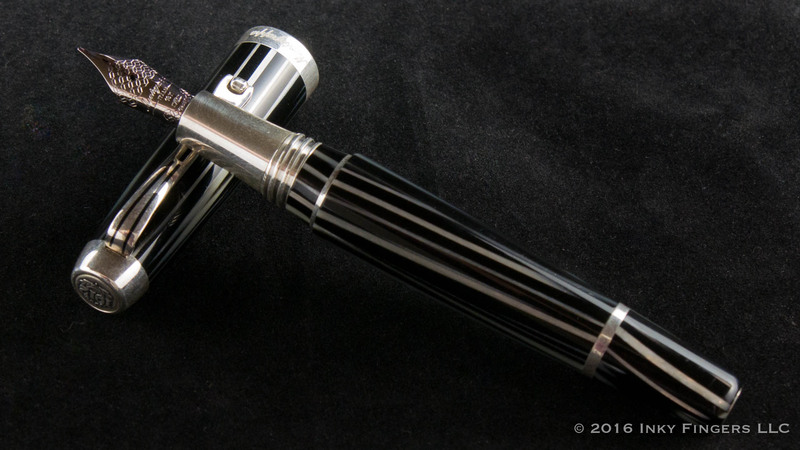 The Montegrappa Passione was recently part of a sweeping re-pricing from Montegrappa and Kenro Industries taking the pen’s MSRP down to $795. 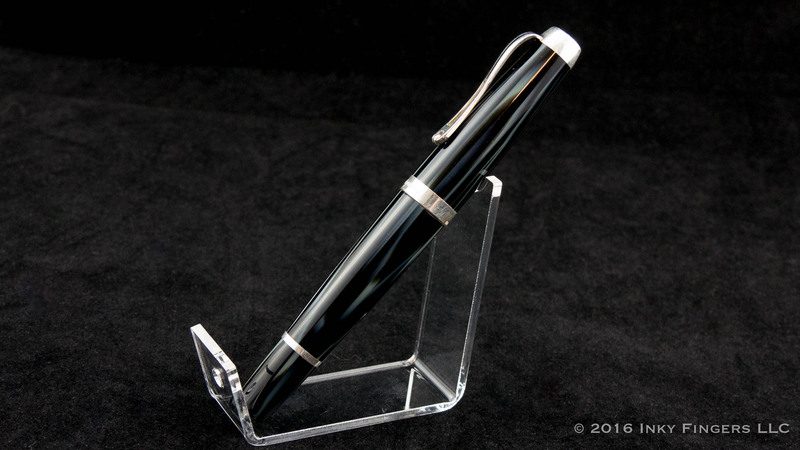 You can find the pen with a retail price of between $690 and $720 from various US retailers. 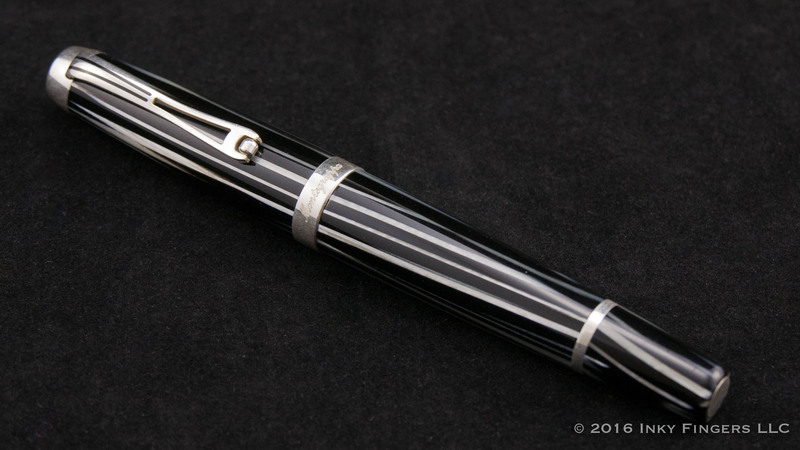 At this new price point, the Passione’s beautiful celluloid, sterling silver accents, wonderful balance, and lovely nib combine with a design that eschews a lot of the showy, gaudy aspects and finally reaches a level of refinement that I’ve been hoping to see from Montegrappa’s offerings for a while now. It’s a lovely pen, and one that I’m sad I am not going to be able to keep. 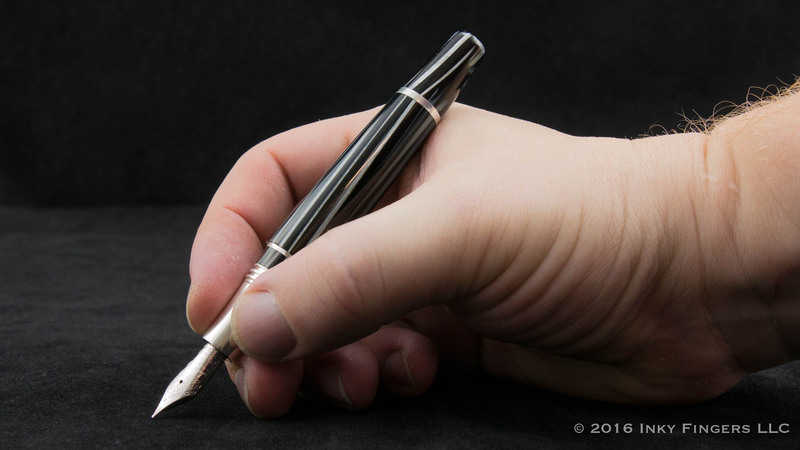 The pen for this review was loaned by Kenro Industries, the US Distributor of Montegrappa. The pen used in this review will be given away to Pen Habit viewers after this review is published. All opinions expressed herein are my own.